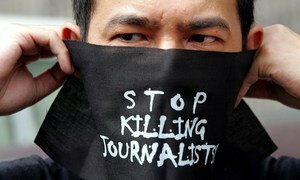 The head of the United Nations agency defending press freedom today condemned the recent murder of a radio news anchor in the Philippines and urged that her killer be brought to justice. Marlina “Len” Flores-Sumera, 45, was killed by a lone gunman as she was leaving her home for work in Malabon City on 24 March. She was a news anchor for radio station dzME’s Arangkada 1530. “The killing of journalists is a severe attack on the basic human right of free expression and on society’s freedom to engage in informed debate,” said Irina Bokova, Director-General of the UN Educational, Scientific and Cultural Organization (UNESCO), who learned of the murder during her recent visit to the Philippines. “During my visit, I saw first hand the Government’s firm commitment to a human rights-based approach to development. This is about fulfilling basic needs like health and education, but also about guaranteeing the right to freedom of expression. “I trust the authorities, who made it very clear that there would be no impunity for such crimes, will spare no effort in bringing those responsible for the murder of Marlina Flores-Sumera to justice,” she stated. The Paris-based UNESCO has been a key partner in media development in the Philippines, where it pioneered the establishment and growth of community radio in the early 1990s. The head of the United Nations agency mandated to protect freedom of expression today condemned the murder of three journalists in the Philippines and the killing of television executive in Honduras this month, urging authorities in both countries to ensure that the perpetrators of the crimes are brought to justice.